This is part of my Intentionally Quirky Hat series. 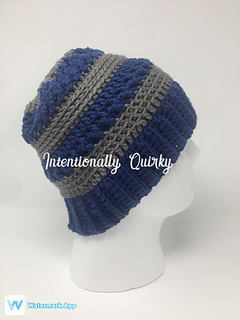 The Slouchy, The Beanie and The Messy Bun Hat all are similarly designed but each a separate, unique design and complete pattern of their own. I have made these completely adjustable to suit personal fit/taste and while I designed the Beanie and Slouchy with my husband in mind, both designs seem to work well and appeal universally to everyone who’s seen or made one. In testing I believe all but one were claimed by women! Hopefully you’ll love this as much as I loved designing it, and if you struggle at all, please don’t hesitate to ask me any questions, I am always happy to help! !